The tour usually takes place at 9:15 am. Additional tours are available at 8.30 am and 10.15 pm during the summer season. The guided tour of Liberty and Ellis Islands is available on a daily basis throughout the year. 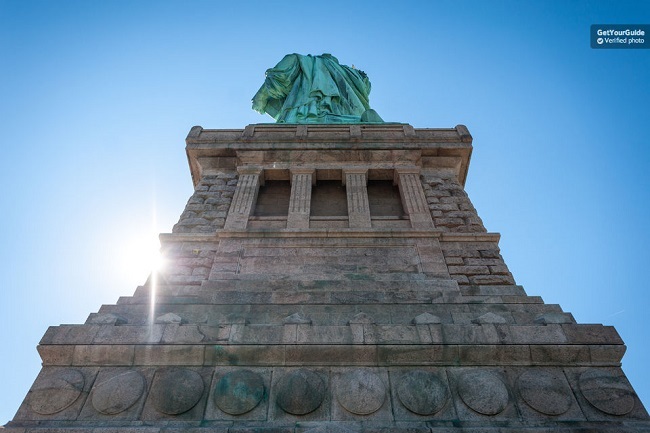 We are comparing Statue of Liberty and Ellis Island Guided Tour Prices from leading ticket suppliers and Try to find you Cheap tickets prices on the market. This enriching guided tour takes you back in time to the period when mass immigration brought various settlers to the American soil. The guided tour introduces one of the fist stopping points that the travellers used on their way to their destination. The Statue of Liberty monument marks this historical. During the guided tour, the participants have an opportunity to examine the iconic monument from afar and up close. From Liberty and Ellis Islands, beautiful views of New York's skyline are some of the most photogenic sites around the city. Furthermore, the tour takes you to neighbouring Ellis Island where you will take a guided tour of the Ellis Island Museum. This engaging half-day trip offers a great experience outside the hustle and bustle of New York’s streets. The tour is therefore ideal for anyone needing a small break from the city. This is an educational tour and it will be especially interesting for fans of history and architecture. Also great for photographers, there will be plenty of magnificent photo opportunities. Your Experience With Statue of Liberty and Ellis Island Guided Tour? During this guided tour, you will take a ferry ride and visit the Statue of Liberty and Ellis Island. The informative tour of Ellis Island highlights the history of immigration to New York and the U.S.A.
Tour the Statue of Liberty's Museum and Pedestal. You’ll aso get to visit the Ellis Island Museum and learn about how the Statue of Liberty. Discover the complicated architecture which keeps our lady standing. .
What Statue of Liberty and Ellis Island Guided Tour Includes? Round-trip ferry to the island. Entrance to the Statue of Liberty's Pedestal. A guided tour of the Ellis Island Museum. To reach the Statue of Liberty's crown, you need to be capable of climbing 363 steps on your way up. You can bring only camera bags and small purses inside the celebrated monument. Using a locker for 2 hours costs $2. Travelers Reviews about Statue of Liberty and Ellis Island Guided Tour? On Get Your Guide, the overall rating of this tour is 4.9 out of 5. On Viator, the tour is rated with a full 5 out of 5-stars. Individual ratings of these islands are mostly around 5 on TripAdvisor. People who have participated in this guided tour talk about the exceptional quality of the service provided by tour guides. Also, comments indicate that the half-day trip offers a great value for money. This activity is not wheelchair friendly. In order to join the guided tour, you must present either a printed or an electronic voucher. Both available providers will offer a full refund if the cancellation is made the specified member of days in advance. If the tour is cancelled (in the case of severe weather or insufficient reservation for) then you will be offered the same tour on an alternative day or issued a full refund. Due to the popularity of this tour, you should reserve your ticket as well in advance if possible. You can bring only water into the Statue of Liberty's Pedestal, bags and other items are not permitted. Meeting Point: Castle Clinton National Monument, located in Battery Park.